ReWire employs a Zero Energy Platform that is assembled from an integration of energy technologies and sophisticated tools that support ANALYZE, REDUCE, ELECTRIFY and REPLACE activities to deliver a customized Zero Energy solution for our customers. The ReWire performance team creates an extensive compilation of all project baseline consumption data and establishes an energy cost and usage analysis, breaking down costs per kWh, by monthly and yearly consumption levels. This meeting assembles the design team to determine overarching Vision, Objectives and Goals of the project. We listen closely to make sure we understand customer needs and priorities. 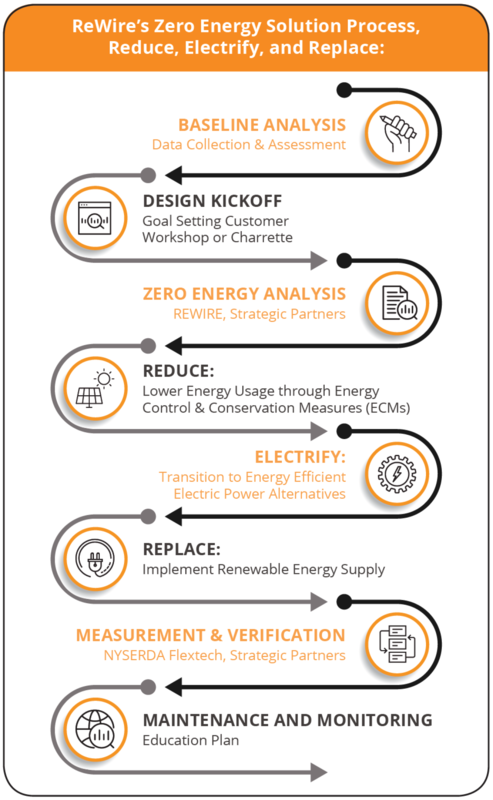 ReWire’s Performance Team summarizes all the information derived from the baseline analysis and consensus developed through the Workshop or Charette to develop the Zero Energy solution analysis. Then, through application of analyses from the energy audit and energy modeling activity we select the optimal set of Energy Conservation Measures (ECMs) supported by financial programs and incentives to drive lower energy usage. This is the most cost-effective way to position customers along the path to achieving Zero Energy benefits. We then identify the best electric system and infrastructure options and programs that support the transition from fuel-based mechanicals and appliances to those that use electricity. Coupled with the reduction of energy use, electrification sets up the next stage of the Zero Energy process. Application of energy modeling and analytics that determine optimal methods and sources of renewable energy to satisfy remaining electricity requirements. This transition includes going from centralized (utility) power to Distributed Renewable Energy and Energy Storage technologies. The Zero Energy Process cumulates in the implementation of a plan that is measured and verified by expert NYSERDA certified consultants. In this phase, an education plan is implemented for the staff, residents and/or employees who will maintain the building for residential living or work space. This is important to secure, protect and maintain the valuable gains created from the Zero Energy building process.